P.S. All opinions are my own and this post is not sponsored. However, I am a proud consultant for Beautycounter. Thank you for supporting brands who make it possible for me to create free content for you! Day 3: Skin, Body & Beauty - TODAY! Priia is an incredible, small biz brand that formulates makeup for acne-prone skin. They specifically keep out ingredients that clog pores, and add in ingredients that keep pores from clogging. If I had a dollar for every time I talked about their products, I’d be rich! Not an ad… just a brand I love! Mineral Foundation: Their powder foundation is one of the products that I ALWAYS come back to. Plus, $30 is a great price, in my opinion, for a good quality foundation for acne skin. Calm Down spot treatment: I love this anti-blemish powder more than any other acne treatment I’ve found (even benzoyl peroxide, which is too harsh for me). It soothes and heals pimples overnight without being too harsh on my sensitive skin. Obsessed! I’m picky when it comes to my skincare because of my acne journey. After two years of testing Beautycounter’s products with skepticism (mostly because I’ve had bad experiences with customer-to-customer brands), I’ve added them to my recommended list of skincare brands and joined their team as a consultant, too! Their mission of BETTER HEALTH aligns perfectly with my health coaching practice. If you want to specifically get Beautycounter info from me, just click here. You’ll be included in my Beautycounter list, and you can browse their website for products if you’d like! Cleansing Balm: Acne sufferers will cringe when they hear this. A rich balm with oils on acne skin? HOW? This balm has actually saved my skin after I had a short phase of destroying my skin with harsh products. I use it to take off my makeup before cleansing at night. I also use it solo in the AM as a cleanser. I ALSO use it as a nourishing overnight mask on any dry areas or (dare-I-admit-it) popped pimples. I recommend getting the regular sized one because you’ll use it all the time. Citrus Mimosa Sugar Scrub: This product makes me feel like I’m at the spa. I use it after I do my pre-shower body brushing. I’m also obsessed with the smell. Body Oil in Citrus Rosemary: After body brushing or using any body exfoliant, you HAVE to moisturize. YOU HAVE TO! This is what has been keeping my skin hydrated and protected from body breakouts in the cold months. I love the nourishing essential oils in this one - yum! Beautycounter Counterman Travel Set: I bought one of these travel sets for each of the men in my life. I feel like guys don’t really like to get into skincare, you know? The fact that this travel set is small, not fussy and effective is perfect for them. I also love the idea that I’m gifting better quality ingredients to the men in my life, since it’s probably the last thing they’re thinking about! Aillea is a great one-stop shop for all clean beauty products! They carry skincare, makeup and just about anything else you’d need. They recently opened a brick and mortar store in Atlanta, too! Ilia Eyeshadow Palette in Prima: These are everything. Okay, so I don’t own this palette (yet!) but I’ve tried it a few times at their Atlanta store and I love the way it looks with my blue eyes and pale complexion. RMS Signature Set: I used this little guy EVERY DAY this summer and felt like a goddess, haha! There are four colors and then a little balm. I love the bold color as both a blush and lip color. Easy for on-the-go touch ups, too! Tongue Cleaners… No, FOR REAL, you guys!!! Maybe this one is a little “out there” for your family, but this is the ideal stocking stuffer. Think about it: we clean our teeth, but there is so much food residue on our tongues. Not scraping your tongue is like washing your hands but not under your nails… You can get a metal tongue cleaner on Amazon for like, 5 bucks. Your mouth, your digestion and your breath will thank you. Still looking for ideas? 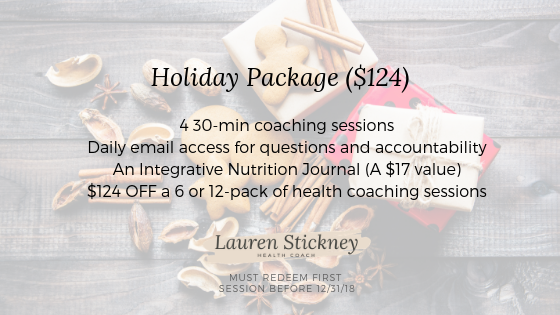 How about my health coaching holiday package? Give the gift of better health to your loved ones or yourself this season! See you tomorrow for Day 4 of the 5 DAYS OF GIFTING where I'm sharing my Goal SLAYING gift guide!